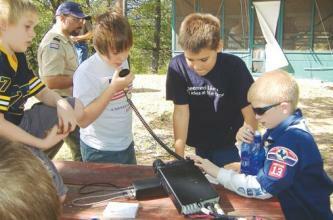 Amateur Radio has a long tradition of outreach to youth through Scouting. Amateur Radio is a great tool for learning--and fun-- in the classroom. 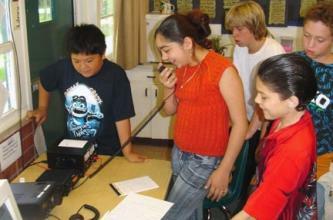 Find out how to introduce Amateur Radio to your local school. The Georgia Section put on an exciting show at the Atlanta Science Festival Expo. "From the moment the doors opened, we had visitors to our booth. Some were quite young, some at the other end of the age spectrum, with many in between. Yes, it would have been far more ‘radio centric’ if were able to be outside as originally planned, but John, Norm, Jim, Mike, and Wes pulled together a great last minute plan B. Though Jim was originally placed with the voice/oscilloscope station, he soon took over for Wes at the Wimshurst Static Machine and spent literally hours entertaining kids with it. Gene took over this position when Jim had to leave. Our booth was usually jammed full of folks talking with the guys or me and/or working the oscilloscope, the Morse code keyer, talking with folks about John’s satellite tracking set up. I sought out teachers and gave them folders used at our presentation at the independent school conference last fall. There were many home schooling parents that picked up our literature, too. Should ‘we’ do this again next year? I don’t care who ‘we’ are, the answer is YES! While our booth attracted and entertained the youngest visitors like I expect all the other booths did, we also reached the older students, including several college students who came by, as well as parents and grandparents. Some found out about radio for the first time, some renewed an old or smoldering interest, some agreed amateur radio is the perfect fit for an exhibition like this." 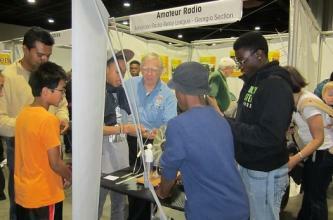 Read more at Amateur Radio Creates Buzz at Atlanta Science Expo.